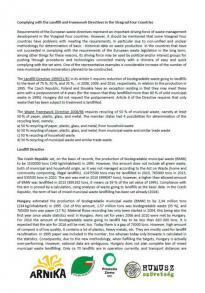 Requirements of the European waste directives represent an important driving force of waste management development in the Visegrad Four countries. However, it should be mentioned that some Visegrad Four countries have problems with meeting the requirements, in particular due to non-unified and unclear methodology for determination of basic - historical data on waste production. In the countries that have not succeeded in complying with the requirements of the European waste legislation in the long term, among other things for these reasons, its driving force may be used by political and/or interest groups for pushing through procedures and technologies connected mainly with a chimera of easy and quick complying with the set aims. One of the representative examples is considerable increase of the number of new municipal waste incinerators planned to be constructed. Táto podstránka bola vytvorená: 28. september 2015 - 22:52, naposledy bola upravená: 29. september 2015 - 1:17.